The YUM in yum cha…. Yum cha (飲茶), the act of going to a Chinese restaurant and ordering dim sum, one of my favourite things to do in the world. As a child, I used to especially look forward to Sundays as we would always go yum cha before being carted off to Chinese School so much so that I would have a little sulk if we didn’t get to go yum cha beforehand. 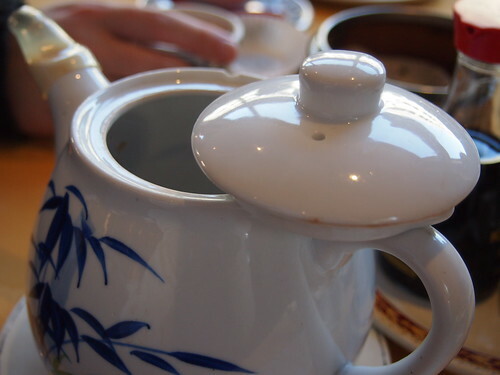 It’s known as yum cha because for all the ordering of dim sum, it was always accompanied by the act of drinking Chinese tea (yum cha means to drink tea). The Mothership always said how she never really drunk Chinese tea at home, but if we went out to yum cha, she would drink copious amounts of tea, mainly because it helped cleanse your palate and there were nutritional benefits from drinking Chinese tea, but I suspect to also help dilute the amount of MSG you were consuming. In Hong Kong, yum cha is mainly a breakfast or morning activity – I remember the first time I went to HK and having to get to a restaurant for 8am and being used as a tool to get seats in a restaurant. Picture it, a child in a foreign land who was very obviously not local given they’re lighter skinned made to sit down on a seat on a large table as soon as a seat became available, watching the other occupants of the table as they eat their dim sum and waiting for them to finish in the hopes that as soon as they finish, an adult will join the child once enough spaces are free. Fine if a small number of seats are required, but little ol’ me trying to keep 5 seats free because there were 8 people in our party was a bit daunting – Especially as some pushy HK housewife would come over and try to force me out of the table because she wanted it for herself. Fortunately, we don’t have any system like that in this Country (if you could call it a system). Besides, we’re British and there’s nothing we like more than to queue if there isn’t a table big enough for ready as yet. Plus, yum cha is a mainly lunchtime offering (especially as restaurants don’t open until Midday). I’ve been meaning to write a post about yum cha and dim sum for some time now, but when an impromptu Tweat Up with Mr and Mrs Lap, Nick, Hannah and Tom was organised, it was the ideal opportunity to do so – Especially as being in a largish group would mean we could get a good selection of dim sum. 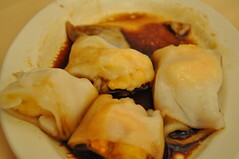 Dim Sum (點心) refers to a style of Chinese food, usually in the form of small plates. I’ve heard Dim Sum being referred to as “Chinese Tapas” but given I am Chinese myself and therefore unashamedly biased, I refer to tapas as “Spanish dim sum” 😉 I’ve already mentioned that traditionally, it’s eaten in restaurants from breakfast or during the daytime rather than an evening meal – Which is why in the UK, most restaurants don’t serve dim sum in the evening (or at least offer a very limited menu). I’ve seen the words “Dim Sum” be translated as either “to touch one’s heart” or “a little piece of heart” but the gist is that the small plates are pleasing enough for everyone to eat. There are hundreds, if not thousands of different dim sum dishes and it’s a style of food which is constantly evolving too with the introduction of fusion cuisine or at least stylised to cater for increasingly diverse tastes and palates. 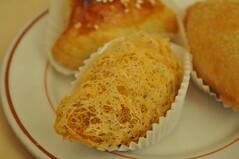 I believe there are some restaurants in China where the dim sum menu alone is near the 400 mark – Imagine eating there! For that reason alone, this isn’t going to be a dim sum 101, but will rather be the beginning in (what I hope will be) a series of posts about Dim Sum. 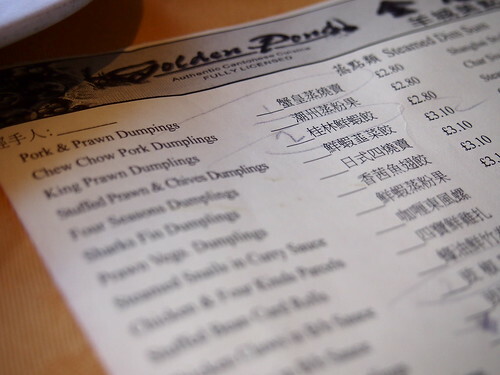 So firstly, let’s talk about the basics as I realise that it can be quite daunting to go into a Chinese restaurant and try to order dim sum when you’re surrounded by Chinese people and have no idea what to order. You don’t see it so much here in the UK, but in HK and China, most restaurants have servers pushing trolleys around the restaurant offering whatever goods they have fresh from the kitchen. In recent years, it’s gotten even more helpful and the trolley actually lists what items are being served (which is even more helpful in a crowded room full of loud people all wanting to make themselves heard). That said, in this Country, most menus are in both English and Chinese, which does open up the possibility of terrible Chinglish typos or transliterations – Desert cake anyone? 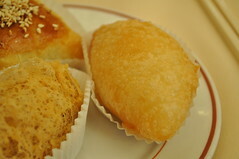 That said, I recognise that it makes it much easier for someone completely new to Dim Sum to order something to eat. 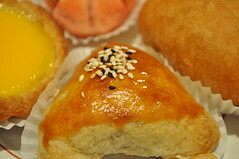 Dim Sum is generally split between steamed dishes (usually consisting of dumplings of some sort), bao/bau or buns, deep fried dishes and pan/wok-fried dishes. These aren’t hard and fast rules and divisions though, buns are generally steamed or even deep-fried but I’ve separated them to distinguish them from dumplings which are generally steamed. 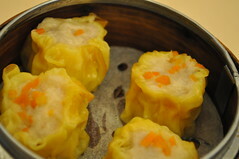 (Although, to confuse matters even more, some dim sum items can be ordered as a steamed, pan/wok-fried or deep-fried dish). 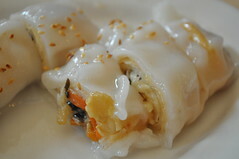 Another dim sum item is Cheung Fun which are sheets of rice flour rolls generally with a meat filling and steamed so that the rolls are soft and tender (I guess they could be called a type of cannelloni made with rice flour), usually served with a special soy sauce (special in that it’s sweeter than normal soy sauce and has some oil added to it). 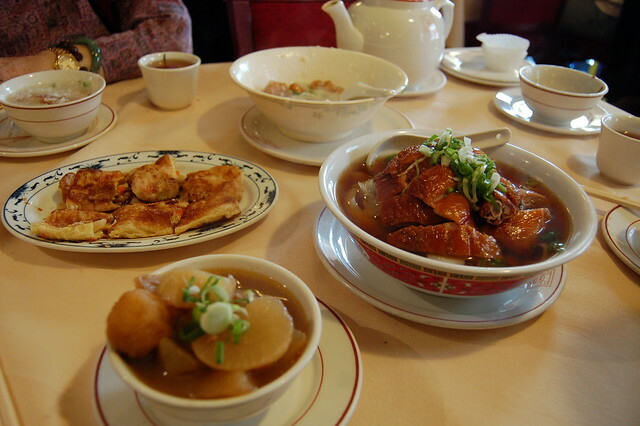 However, when you go yum cha, it’s not just about dim sum – It is the norm to order some larger plates to go complete the meal, be it some noodles (wok fried or in soup), perhaps a (combination of) roast meat and rice, or even a bowl on congee (juk). In recent years, I’ve noticed that restaurants like to offer you a mixture of savoury and sweet pastries to go with your tea as you wait for the rest of your table to arrive or simply something to nibble on whilst you look at the menu. When I was younger, I used to love Ham Siu Kok (鹹水角) which is a deep fried rugby ball-shaped dumpling made of sweet rice flour with a filling of minced pork and some vegetables which is slightly salty to contrast with the sweet rice flour. If they’re fried properly you get a crisp, crunchy exterior yet on the inside, it the rice flour dough should be soft and almost gummy against the grain of the filling. Very similar to the ham siu kok is the Wu Kok (芋角) or the Taro Puff, the filling is practically the same as the ham siu kok but the casing is of mashed up taro with some flour added to it and being deep fried gives them their distinct appearance – I used to call them hairy when I was younger and I still haven’t really learned how or what causes it, I only know I like that and will happily gorge myself on them if at all possible. 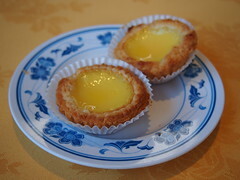 You may also get a Chinese egg custard tart which are very different to the English ones we may be accustomed to in that the pastry is in the Chinese version is much flakier (there’s more lard in it!) and the filling is much sweeter – Rather than eggy with a hint of sweetness. More to the point, there’s no nutmeg anywhere near the Chinese version! You may also be offered a Char Siu baked ( generally triangular-shaped) dumpling, which is char siu in a sweetened sauce in (again) a slightly salty, flakey pastry. Dumplings, in particular xiao long bao (sometimes called Shanghai Dumplings and I’ve seen them transliterated as Siu Long Bao too) are quite fashionable now, there’s even a restaurant in London’s Chinatown naming itself “Dumplings Legend” which I think it is a pretty bold statement to make. 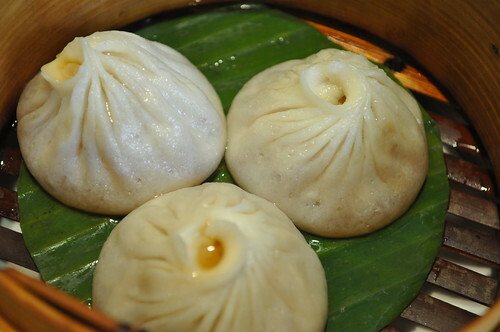 Xiao Long Bao are dumplings filled with generally pork or chicken, but the main thing is that there is hot stock WITHIN the dumpling, so you break into the dumpling and drink the stock first before enjoying the rest of the dumpling. 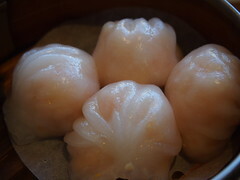 As with the har gau, there’s a deft skill required to make the dumplings in that the skin shouldn’t be too thick, but thin enough to hold in both the filling and the stock without breaking. Again, the emphasis is that the XLB shouldn’t be too big but still delicate enough to eat in one or two mouthfuls. 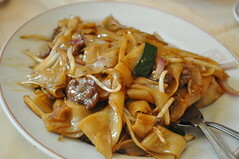 Cheung Fun is another item I like to order. Actually, I particularly like prawn Cheung Fun which are very similar to har gau and if I had to decide between the 2, Cheung Fun wins every time. 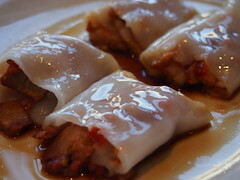 Soft, slippery rolls made with rice flour and filled with meat of choice in a sweeter Cheung Fun soy sauce, they’re a must-order item whenever my family and I go yum cha. The rolls themselves should be soft and yielding, without being too thick or solid so that they are strong enough to pick up with chopsticks into a bowl, but soft enough to break down into smaller mouthful without any bounce s. An example of how dim sum dishes are constantly being redeveloped is how one place I go to wraps Cheung Fun around a Vietnamese spring roll, the rolls are then cut into bite-sized chunks and served with nuoc cham – Delicious! 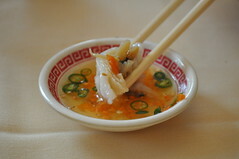 I mentioned earlier that most people order a plate or rice or noodles to go with the dim sum too. Personally, I wouldn’t go for a roast meat and rice purely because I will inevitably order a bowl of congee, so to order roast meat and rice too would be rice overload. 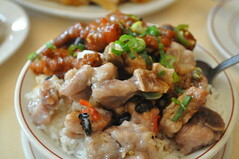 Instead, I go for a smaller bowl of rice, usually steamed spare ribs on their own or with phoenix claws in black bean sauce perched on top. Then you have your noodles; a favourite when growing up was the Special Chow Mein which I can guarantee is wholly different to what you may be accustomed to from your local Chinese takeaway. Instead, the noodles are impossible crisp without being deep fried and mop up an assortment of meat, seafood and vegetables in a thick, gloopy sauce. The contrast of textures of the crisp, crunchy noodles with the savoury sauce and whatever meat/veg combo is great – especially if you mix in plenty of chilli oil sediment as I like to. 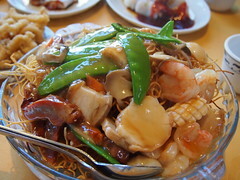 If I’m not in the mood for crispy noodles (“because they hurt my mouth to eat them”), I like stir-fried rice or udon noodles, sometimes with an assortment of seafood or increasingly so, dry-fried with beef. Again, they’re given the chilli oil sediment treatment to really jack up the flavours (and yunno, I live on the edge of destroying my tastebuds like that). However, there are times when I want something a bit more soothing so something like wontons and noodles in soup or even better, roast duck with flat rice noodles in broth. 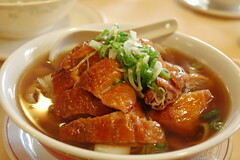 I am salivating just thinking of how the broth is full of the flavourings from the roast duck – so plenty of star anise and 5-spice powder with ginger and spring onions.. Sometimes, nothing can hit that sweet spot better than roast duck and flat rice noodles in broth. So that’s it, I’ve listed (what I call) the main dim sum dishes but I’m hoping to constantly come back to this topic as I talk about different restaurants and/or one particular dim sum item (including items which may appear to be a bit funky to eat). Whenever we go out yum cha, the bill usually comes to around £10 a head – Any more and either you’re eating at a stupidly expensive establishment or you’ve been ripped off. Either way, yum cha is certainly yum(my) and I hope a visit brings you as much enjoyment as it does for me. This entry was posted in Eating Out on February 18, 2012 by YSL. 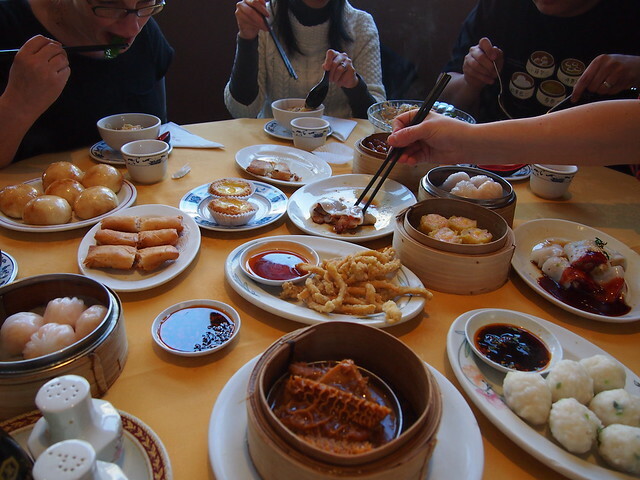 Great post, thanks so much for sharing this info and your photos, I feel a lot more inspired & confident in planning a yum cha outing after reading this, and it all looks and sounds so delicious (and good value!) – looking forward to more posts on this subject! Tapas is Spanish Dim-Sum you’re damn right! My favourite item above all others are the Phoenix Claws, which are a euphemism for chicken feet steamed in black bean sauce. It’s always the first thing I order. If a restaurant doesn’t do a good version of these I will rarely go back. Love this post Yen! Already looking forward to going again.